Onstage he was the writer, producer, and star of MICKEY FINN in the 2000 world premiere production at the Royal George Theatre. Selected scenes from this play were published in “Best Stage Scenes of 2001.” In 2004 he wrote, produced, and starred in TAPIOCA, a comedy experiment, at the Beverly Arts Center, which was the genesis of his film which is currently in DVD distribution. 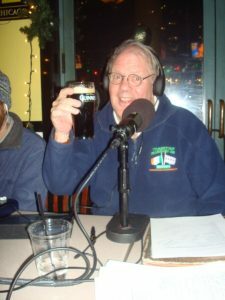 For six years he entertained audiences as the author and star of his one man comic memoir of Irish Chicago, GOIN’ EAST ON ASHLAND, from 1993-1999, playing to sold-out crowds at Piper’s Alley, The Beverly Art Center, The Irish American Heritage Center, The Royal George Theatre, The Ivanhoe Theatre and The Rialto Square Theatre in Joliet. Also in Chicago he starred in Neil Simon’s hit comedy LAUGHTER ON THE 23RD FLOOR at the Briar Street Theatre. Mike studied acting at The Goodman School of Drama and the University of Illinois at Chicago. He performed in Chicago with The Organic Theatre, The Chicago City Players, and The Court Theatre before embarking for the East Coast where he joined The American Shakespeare Festival in Stratford, Ct. in 1973. He appeared in the classics at Stratford for four years, primarily in character roles in JULIUS CAESAR, ROMEO AND JULIET, MEASURE FOR MEASURE, TWELFTH NIGHT, MACBETH, THE COUNTRY WIFE, A WINTERS TALE, MUCH ADO ABOUT NOTHING, KING JOHN, and most notably as the Fool in KING LEAR starring Group Theatre founder Morris Carnovsky and as Howie Newsome in OUR TOWN starring Fred Gwynne, Geraldine Fitzgerald, and Eileen Heckart. He also began performing across the country with the nation’s leading repertory theatres, appearing at The Goodman Theatre in TOOTH OF CRIME, TIS PITY SHE’S A WHORE, and HENRY IV, with the McCarter Theatre in Princeton in O’Neill’s BEYOND THE HORIZON, Tennessee Williams’ KINGDOM OF EARTH, ROMEO AND JULIET, and MUCH ADO ABOUT NOTHING, with Syracuse Stage in O’Casey’s PLOUGH AND THE STARS and Moliere’s TARTUFFE, with The Long Wharf Theatre in New Haven in Tom Murphy’s ON THE OUTSIDE, at the Kennedy Center in Washington in MACBETH and MEASURE FOR MEASURE, in Philadelphia at the Annenberg Center in MUCH ADO ABOUT NOTHING, and with The Folger Shakespeare Theatre in Washington D.C. as Parolles in ALL’S WELL THAT ENDS WELL. In New York he appeared Off-Broadway in several new plays and made his Broadway debut in Tom Dulack’s SOLOMON’S CHILD at the Helen Hayes Theatre. In 1978 he founded Penumbra Productions in New York City, an Off-Broadway producing organization where he began to produce and direct theatre. He won the 1981-82 New York Drama Desk Award for outstanding production of a revival for his production of Joe Orton’s ENTERTAINING MR. SLOANE as well as producing and directing several New York and World Premiere productions Off-Broadway; among them Jack Gilhooley’s THE BRIXTON RECOVERY, directed the American Premiere of Neil Donnelly’s UPSTARTS at the Irish Arts Center, and with Chris Hart he produced the New York Premiere of Erik Brogger’s political satire THE BASEMENT TAPES at the Village Gate. In 1985 he returned to his hometown of Chicago to produce and direct Peter Nolan’s political comedy THE 51ST WARD and also produced the Marriott Lincolnshire’s production of the Broadway hit musical BABY at the Forum Theatre. Since returning to Chicago he has produced and directed several television programs and documentaries, most notably “Nolan’s Cracker Barrel” on WLS-TV(ABC) in Chicago and “Takin’ Back Bucktown,” which won the International Television Association PHILO Award for Public Service Media. Since 1991 he has been President of Mike Houlihan Creative, an advertising, public relations, and marketing firm servicing such clients as The Chicago Board of Trade, Metra, The Brick Marketing Council of Illinois, Illinois Secretary of State’s Office, and The Cook County Assessor. Mike’s comic commentaries have been featured on public radio in Chicago. He is a frequent guest on Chicago radio programs and has performed his stand-up comedy act at Zanie’s and Barrel of Laughs, as well as several private and corporate functions.